The Cybex Remanufactured Cyclone 530r recumbent bike is an older version of the company's current recumbents. It's a bit clumsier and not as sleek, but it's still got power and quality engineering. We've said it before and we'll say it again - Cybex puts incredible attention to performance and comfort into every one of their recumbent bikes. It makes them very popular with physical therapists and physical rehab centers, where the Cybex Remanufactured Cyclone 530r recumbent can take a beating and still perform flawlessly. The bike mode on the Cybex Cyclone 530r works as though you're actually biking outside. The faster you go, the more difficult it will be to pedal due to wind resistance and drag. When you go faster than 15 miles per hour, it will become increasingly difficult to pedal. It's the perfect mode for getting you in shape for real mountain biking. Constant mode allows you to pedal at your desired speed while the bike maintains a consistent work load. 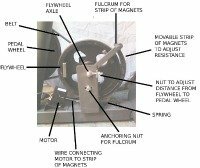 The most advanced program is the isokinetic mode, which challenges users by accommodating resistance so that users can maintain a higher RPM despite fatigue. It's great for improving muscle strength and endurance. Dimensions: 58" x 25" x 47"
UPDATE:the 530r is no longer available. 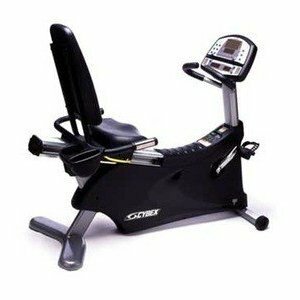 Check out the latest recumbent bikes on the Cybex site. 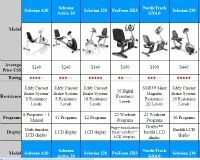 This is an older version of the recumbent bikes that Cybex has been manufacturing with exceptional parts for years; consequently, users are uniform in the positive reviews they give for the Cybex Remanufactured Cyclone 530r recumbent bike. Some people notice that this model is a bit clunkier than more recent models, but they are still happy with the performance they get from it. A few reviewers commented that this model's age, despite being completely remanufactured, could mean it won't last as long as a newer model such as the 700r, which is also available remanufactured and restored to factory specifications. But they also conceded that since the refurbishing companies are backing this model with the same warranty as the newer ones, buyers would still be protected. If price is a concern, you can get this model for anywhere from $1,500 to $2,000 refurbished, which puts it right on par with other Cybex models that have been discontinued but are still available. The Cyclone 530r recumbents are still performing in smaller health clubs, high school and college gyms and sports training facilities. These things just don't want to die. In fact, most owners admit that they finally retire their Cybex Remanufactured Cyclone 530r recumbent bike not because it stops working, but because they eventually want more bells and whistles and are willing to pay more for them.